Some parents are eager for their babies to crawl. THIS mom was dreading it. After having one early crawler, I knew what was coming and I wasn’t in any rush for number two to start crawling or moving in any way. Of course, that meant she was an early roller and crawler. Of course. Since she is constantly on the move, I am always trying to redirect her away from all the things she is trying to get at. I.e. all the things she shouldn’t be touching! This is not an easy task and her toys are only so engaging. 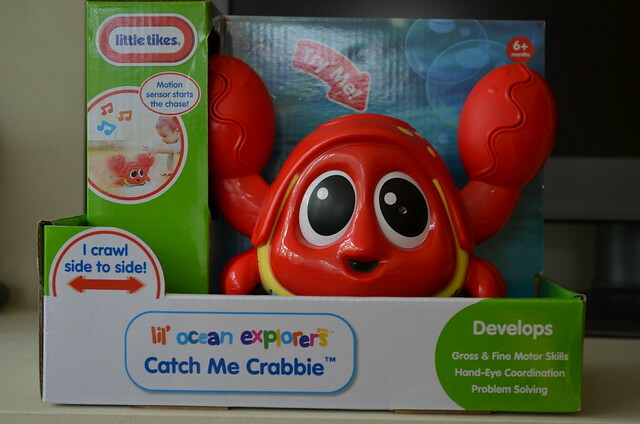 We received the Little Tyke’s Lil’ Oceans Explorer Catch Me Crabbie to try out and it was pretty fun. This little critter has a built in motion sensor so when the baby gets near enough, the crab shuffles side to side (as all good crabs do) and plays music while snapping its claws. Baby E thought it was fun to press the start button and get the music going and she took off after it quite a few times. Even my six year old thought it was cool and was pressing the button over and over to hear the music. 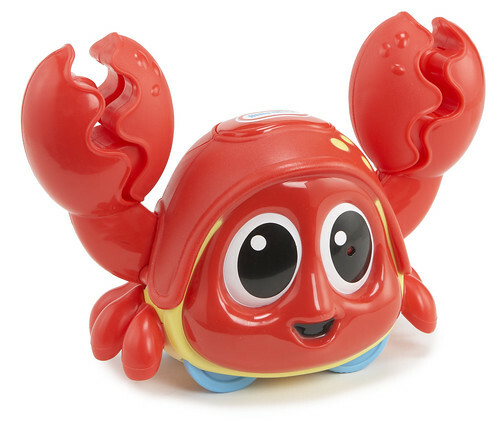 The MSRP for the Catch Me Crabbie is a very reasonable $16.99 CDN ($14.99 USD) and it is available at Toys “R” Us. Most electronic motion capable toys retail for much higher than this and I think this sets this particular toy apart. It does require 3 AAA batteries but these come included with the toy. I also like that this little guy is quite small and easy to put away and store. We have enough stuff in our house between the two kids and I really like that this toy encourages physical activity but can be tucked away easily. If you are in the market for a great baby toy that will get your little one moving (at your own risk!) this Little Tyke’s Crab is perfect for you. Oh, I need this for my new grandkids! My grandson is almost to the point of crawling so this would be perfect! This would be an awesome Christmas gift for my nephew! Oh this is cute, fantastic price too! Cute toy and it’s fun! Love it! This would make a great Christmas gift for my nephew. OMGoodness this toy looks adorable!